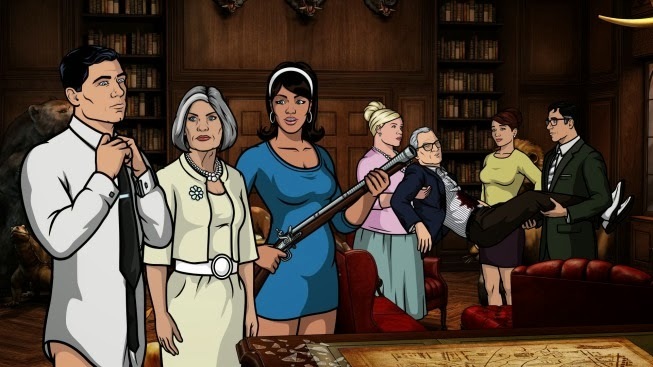 The Talking Box: Archer Vice - Aren't We All Just Drug-Addicted Ants? Archer Vice - Aren't We All Just Drug-Addicted Ants? 2,000 pounds of cocaine (minus whatever we lost in Miami) plus the million in fake bills ain't bad... which is what I was trying to tell Mother when Ron chimed in about... something, cars maybe. Cyril had the genius idea to buy a bunch of guns with the fake money, which actually wasn't a bad idea because the FBI seized all of ours and Lana and I had both been stealing bullets from work. Turns out, ISIS had pissed off anyone we might do business with to buy guns. Drunk, naked Ray was still coaching Cheryl on being a famous country music singer. Oh yeah, and Pam bought a million dollars of amphetamines from the Yakuza, who obviously came after us when they discovered the money was fake. After arguing over what to do with the Yakuza, Cheryl walks in and makes it worse by attempting to negotiate with them. The one useful thing she did do was show us to the massive old weapons collection in the house. Ron refused a gun to help out with the shooting, and then got shot. Ha! Turns out, Cheryl's great-great-great-uncle built loads of underground tunnels searching for runaway slaves to sell back to their... you know what, let's just call her family insane and move on. I devised a plan to split into groups and get Ron out through one of the tunnels while I staged a distraction through a tunnel near the front of the house. Ron was being a real baby about it. Hell, I've been shot 26 times... that's a lot of lead. Mother and Lana had some mother-to-mother time while I snuck into the limo of the Yakuza leader. I gracefully (using a very loud gun) negotiated a deal where he forgave Pam's honor debt, but we had to give him $5 million in coke. And Woodhouse really spent a lot of time in the old timey gym... dude better be getting buff.